Motorsports takes many forms, from door to door showdowns on half mile ovals, to the staging duel before the flash of green on the Christmas tree, to round the clock endurance tests of man and machine. No matter what form it takes, the excitement and speed of motorsports is universal. Each Thursday night, Darryl Kinsey Jr takes you for a journey through the wild, wonderful world of motorsports action. 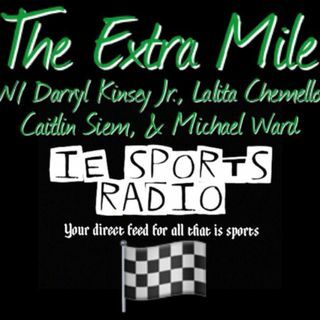 The Extra Mile, hosted by Darryl Kinsey Jr, Caitlin Siem, Lalita Chemello, and Michael Ward ... Maggiori informazioni Thursdays at 8pm et/5pm PST on IE Sports Radio. The Extra Mile #86: The Implosion of Ferrari, it's Bristol Baby!